I need to begin this report with an apology to my fellow riders and any bystanders for the unpleasant sounds that my drive train was making. I thought the issue had been sorted, but clearly not. I throw myself on your mercy and hope that it was punishment enough that I had to listen to it for 100 miles. 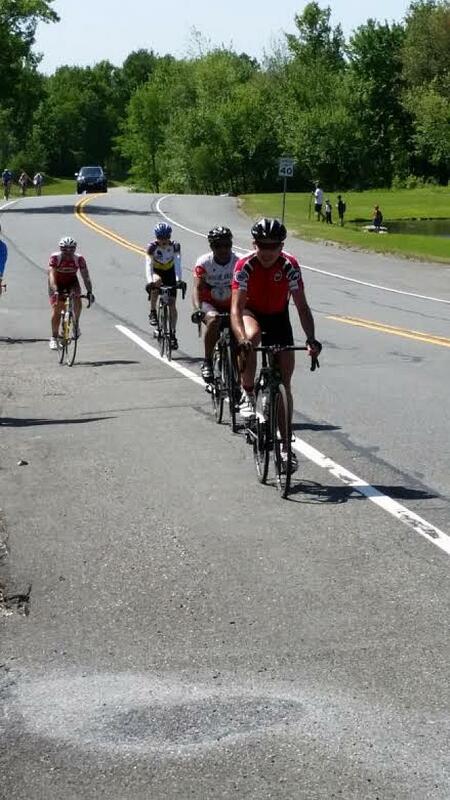 Riders reach the summit in High Point State Park. Combined with a puncture with about 25 miles of the 100 to go, I did not have a great time on the equipment front, but it was still a hugely enjoyable day in the saddle on the border of New Jersey and New York. It is difficult to believe that Butler, NJ, home to the start and finish hosted by the High Point Wheat Beer Company and its German-style Ramstein beers, is just 35 miles from Manhattan. The landscape of state parks, nature reserves, farm fields, paddocks and woodlands was beautiful and distinctly un-urban. You could have been just about anywhere. 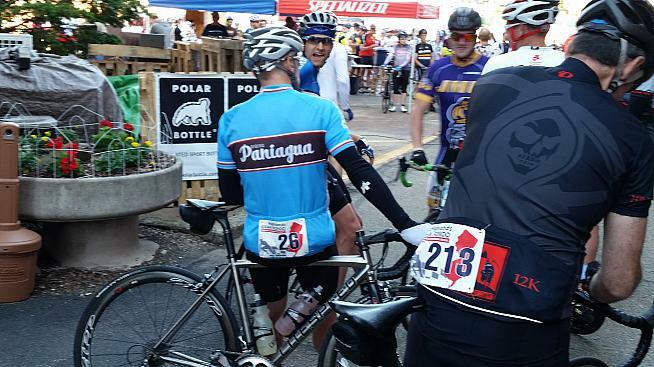 Race organizer Reuben Kline's approach is to lay out the course on roads which do not require traffic control and the Highlands Gran Fondo course worked well. There were a couple of occasions when I had to unclip at junctions and a few more where it was wise to slow right down before a turn, but traffic was light. That was doubly good given that very large pick-ups seem to be a popular choice in northern New Jersey. The relatively small scale of the Highlands GF makes it an easy event for the rider with limited standing in line, plenty of time to chat, and a relaxed and friendly vibe. Waiting for the start at the Highlands Gran Fondo. There was no relaxed warm-up for the 350 riders though once the National Anthem had died away. The course heads north from Butler and up through Norvin Green State Forest with approaching 1,000 feet of climbing straight off the bat in the first seven miles. After a bit of up and down and a drop of a few hundred feet the second significant up section came at mile 14 and where it flattened off at the top came the first timed section of around four miles. I am not quite sure where I stand on timed sections within a gran fondo. I pretty much ignored them and rode a steady pace. Others were taking them seriously, to the extent of a few people I saw stopping before them to prepare before time trialing through. There were certainly a few large bunches who were taking it at a relaxed pace and then pouring it on between the timing strips. Those who raced between the timing strips had a steep descent on which to recover before the first of four aid stations. It was on this descent that two riders in front of me ended up in the ditch on a sharpish (but well marked) lefthand turn. They shouted they were fine and my guess is that the loose gravel on the turn prompted hesitation on braking and turning and the excursion off the tarmac. We crossed over into New York during the timed section and the route took a 45 degree slant to the left running North East roughly parallel to the state line up to High Point State Park on the Jersey side. 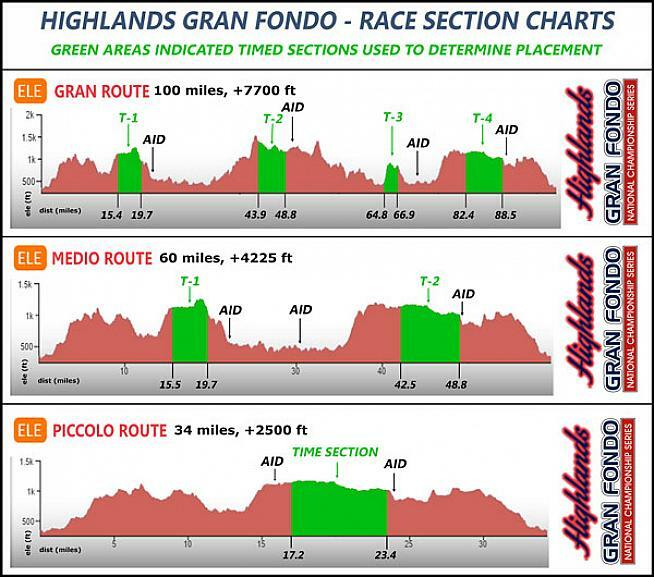 The Routes of the Highlands Gran Fondo. The accurately named park is the highest spot in New Jersey and the route rose 1,100 feet from mile 34 to the summit at 1,500 feet with a lot of that gain in the last mile or so to the top on Route 23. The struggle to the peak was rewarded by a beautiful section under overhanging trees on a narrow road in the park. A new addition, it was been closed to cars for us and was the second timed section. The first half was bliss with a new surface on the road in contrast to the bumps (concealed by the shadows) of the second half that threatened to loosen fillings. I ignored the second feed stop that followed and it was on the fast and fun descent down from High Point State Park that I saw the bear on the inside of a sweeping bend. Perhaps it was the noise from my drive train that caused it to turn tail so quickly and it disappeared in a blur of glossy black fur. We crossed the Wallkill River National Wildlife Refuge before a vicious climb that touched 20% in parts at 65 miles. My legs were having an okay-but-not-great day and it was a case of spinning rather than charging up the slopes. I ended up riding most of the course on my own, which was probably for the best given my mechanical soundtrack. Down the other side things were mixed up with a mile-long stretch on a dirt bike path and a walk across a wooden bridge before the third aid point and cheerful volunteers offering assistance and food. Does anyone really eat the pickles on offer? A few miles of the relatively flat brought us to the final big ascent of the day (and my inner tube swap - God bless CO2 canisters) before 15 miles up high weaving between lakes and ponds of all sizes. 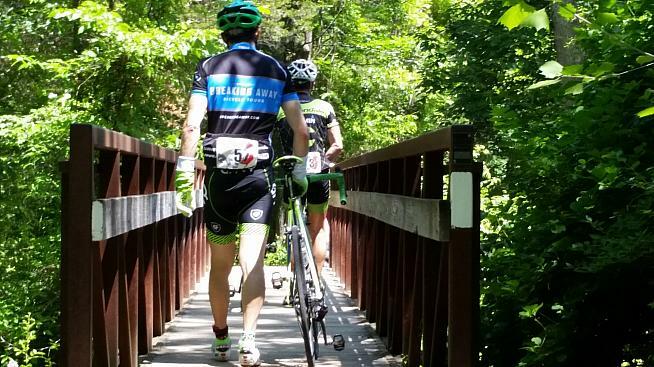 There was a noticeable breeze for the first time and then the welcome five mile descent into Butler and the finish. The Highlands Gran Fondo is the northernmost outpost of the Gran Fondo National Championship Series, with events in Florida, Georgia, California, Colorado, North Carolina (Asheville and Boone) and Maryland as well. 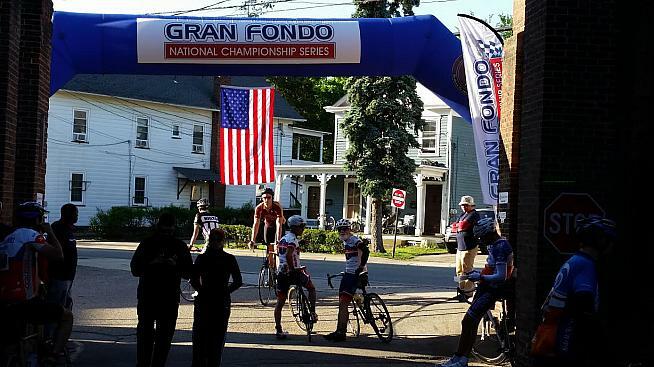 The 8-race series, which began in 2012, culminates in the national championship in Frederick, Maryland,on September 20. And I have tracked down Ramstein beers in a liquor store just a few miles down the road from me - Prost!